The Nokia Lumia 920 is the new flagship from Nokia with 4G LTE. It's also their first phone to feature the latest Windows Phone 8 OS. 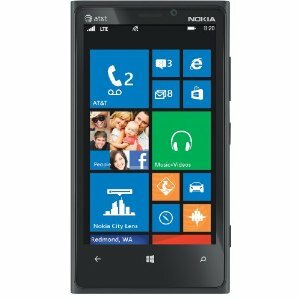 The handset keeps the same design as the Lumia 900 however this one has a stunning 4.5-inch touchscreen display that is using PureMotionHD+ technology. The display is super sensitive and can even be used when wearing gloves and the screen automatically adjusts the tone and brightness according to light conditions so you get the best view. The 8-megapixel camera includes PureView technology that delivers better image stabilisation and gets better images in low light conditions. Other features of the camera include Carl Zeiss optics, LED flash, geo-tagging and video recording at 1080p. Windows Phone 8 is on board and coupled with the dual-core processor the phone can handle multitasking easily. The OS brings some nifty new features to the phone including a Nokia City Lens app that gives you an augmented reality view of the local area so you can find local businesses and points of interest. Another new feature of the Lumia 920 is wireless charging with separate accessories such as the Fatboy pillow allowing you to simply place the phone on the pillow to charge it. The Lumia 920 is bursting with connectivity options including 3.5G, GPS, Wi-Fi and NFC as well as 4G capabilities. The essential smartphone features are all included such as social network integration, a multimedia player and a document viewer as well as a front facing camera for video calling and an internal memory of 32GB.